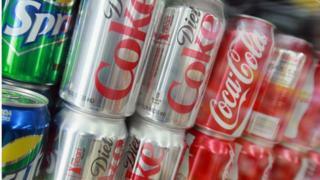 Consumer Price Inflation fell to 2.4% in April - its lowest level since March 2017, official figures show.The fall from 2.5% in March was partly blamed on the timing of Easter, which meant a seasonal rise in air fares was not included in April this year.The figures did show the effect of the sugar tax, which drove up the prices of soft drinks and juices.The fall in inflation will ease pressure on the Bank of England to raise interest rates. "Inflation continued to slow in April, with air fares making the biggest downward contribution, due to the timing of Easter. This was partially offset by the rise in petrol prices," said Mike Hardie, head of inflation at the Office for National Statistics (ONS). Petrol prices are at the highest level for three and a half years. The average price of petrol has risen to 127.22p a litre and diesel to 129.96p following a rapid rise in the cost of oil.That means the fall inflation could be short-lived, according to analysts. "The recent weakness in the pound and the rising oil price are a concern and could quickly reverse the drop in inflation," said Kevin Doran, chief investment officer at AJ Bell.He also warned that a fall in the value of the pound could drive up costs of imported goods for shoppers and businesses.The pound fell by around half a cent against the dollar after the inflation figures were released. It then recovered to trade at $1.3368.Inflation on the Retail Prices Index (RPI) measure rose to 3.4%, from 3.3% in March.